The Informant! is the fifth collaboration between Matt Damon and director Steven Soderbergh, whose previous credits include Che, the near-perfect crime flick Traffic and the Ocean’s trilogy. Bearing certain parallels with Erin Brokovich, another Soderbergh vehicle, the story is based on journalist Kurt Eichanwald’s book about the lysine price-fixing conspiracy of the early 1990’s. Eichanwald detailed how every few months, agricultural company representatives from the United States, Japan and South Korea would secretly meet to discuss ways in which to raise the price of lysine, a common additive to livestock feed. The subsequent criminal investigation resulted in fines totalling tens of millions of dollars, and jail time for a number of the executives involved. The figure at the centre of the fallout was Mark Whitacre, a high-ranking employee at one of the company’s involved who eventually turns FBI informant. Complicating matters are his bipolar disorder, complicity in many of the illegal deals and the burgeoning sense of entanglement as matters quickly escalate out of his control. Sporting a paunch, glasses and a moustache Damon is all but unrecognisable as Whitacre, and puts in a virtuosic performance as the corporate whistleblower growing increasingly unhinged by the pressures inherent of his double life. This latest outing from the prolific Soderbergh has a number of strengths. The sets and cinematography are first rate, and the director and his DP manage to really capture the look and feel of mid-90s corporate America, down to the dated tan briefcases and blow-dried hair. Complimenting Damon’s polished performance are an excellent supporting cast, which includes Melanie Lynskey as Whitacre’s wife and Scott Bakula as the FBI agent responsible for reining in his increasingly erratic mole. 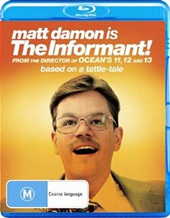 The problem is with the overall tone of the film; never quite certain whether it wants to play it straight or go all-out for laughs, The Informant! winds up feeling decidedly muddled as comedy and high intrigue share a decidedly uneasy co-existence. Even the jaunty exclamation mark in the title seems inappropriately whimsical, as though corporate scandal, incorrigible criminal activity, mental instability and the risks involved in intelligence gathering were nothing more than grist for the comedy mill. It just doesn’t work, and without a stellar performance from Damon would collapse altogether under the weight of its own confusion. The Blu-ray release is solid. Audio and picture quality are impeccable, and there are a couple of decent bonus features in the way of deleted scenes and a spirited audio commentary by the director and screenwriter. As it stands however The Informant!, despite its depth of casting and competent lenswork, feels as though it has been irreparably damaged by a shameless attempt to have its cake and eat it too. As the film itself shows, greed just doesn’t pay.